One sunny morning, Tia and Roxy went out to pick some flowers for their mum. They skipped hand in hand, happily down to the bottom of the garden, until, suddenly, unexpectedly everything went black. Tia turned to see Roxy’s head poking up from the cotton wool ball with what looked like a mouthful of cloud! “Iff candyfloff, Tia,” said Roxy with the biggest smile on her face. They tucked into the candy floss. But the more they ate, the further they sank. Down they sank until, eventually, they reached another level, and stepped off the cloud onto a chocolate path surrounded by lollipop and marshmallow trees on either side. Tia and Roxy could not believe their eyes. They were in sweetie heaven! As they began to follow the chocolate path, they heard a low rumbling noise. “Was that your belly Roxy? You must have eaten too much candyfloss,” said Tia. “No. That’s not me Tia, it’s that,” said Roxy pointing to a huge doughnut shaped volcano exploding with jam. They both giggled and ran towards it licking their lips. “Noooooooooo!” came a high-pitched squeak. It was a tiny gingerbread man sitting on a nearby hill of jelly. “You’ll get stuck in the jam if you go in there,” he warned. “But I can show you the yummiest thing in Sweetie Land. Follow me,” he said, sliding down the jelly. Tia and Roxy followed the gingerbread man past the volcano, through a field of jellybeans, across a chocolate-finger bridge and into a village made from liquorice allsorts. They entered a house and inside they saw the biggest selection of ice cream they had ever seen. “Tuck in!” said the gingerbread man. And so Tia and Roxy ate. They ate toffee, strawberry, mint, vanilla and butterscotch ice-cream. They ate until they couldn’t eat another mouthful and sat down, bloated and tired. “I haven’t had butterscotch ice-cream since we went to the seaside with mummy and daddy,” said Tia. “Me too. But how?” said a worried Roxy. Suddenly Sweetie Land didn’t feel so sweet as home. As Tia and Roxy ate the popping candy they felt a tingling on their tongue, reached out to hold hands, closed their eyes and wished. When they opened their eyes again they were back home in their garden. Tia Finch was the winner of our Writing Wizardry competition in 2015 with her fantastic short story The Sweetest Fall. 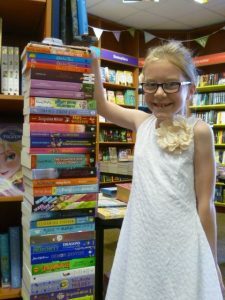 If Tia’s story has inspired you to get writing and you want to be in with a chance of winning your own height in books, why not enter our 2017 competition? More information can be found here.